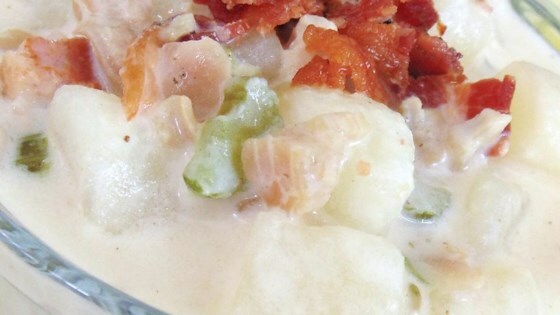 "A delicious California take on the traditional New England clam chowder. We serve this every Christmas Eve." Place bacon in a large skillet and cook over medium-high heat, turning occasionally, until evenly browned, about 10 minutes. Drain bacon slices on paper towels and crumble, reserving the drippings in the skillet. Cook and stir potatoes, celery, and onion in the bacon grease over medium heat until cooked through and tender, 10 to 15 minutes. Drain grease from skillet and stir seafood seasoning, garlic salt, onion powder, thyme, and white pepper into vegetable mixture until evenly coated. Melt butter in a large, heavy saucepan over medium heat. Whisk cornstarch into melted butter until smooth, 1 to 2 minutes. Stir half-and-half and milk into butter mixture until thickened and smooth, about 5 minutes. Drain juice from canned clams and stir juice into milk-butter mixture; add vegetable mixture and stir. Cook and stir soup until heated through but not boiling, about 5 minutes. Stir clams into soup and simmer until heated through, about 5 minutes. Sprinkle bacon and drizzle red wine vinegar over soup before serving. You can adjust the thickness of your chowder by increasing or decreasing the amount of milk. This chowder is really really good! It's the closest thing to Fisherman's Wharf in San Francisco that I've found. You don't need to change anything in the recipes at all. Fairly easy and well worth it! Absolutely delicious! I did a few less clams and a few more veggies by mistake... But it still worked. I also probably could have stood to do just a smidge less of corn starch.